What are heel spurs? why did I get a heel spur? 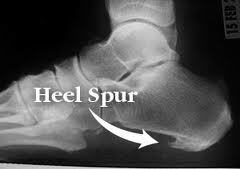 X Ray view of Heel Spur. The cause of heel spurs is the inflammation of a thick band of gristle that runs long ways through the arch called the plantar fascia. This commonly occurs at the point of attachment to the calcaneus / heel bone. At this point, the tissue splits up into 10,000 fibres, each of which punctures the bone to hang on. This anchor point is called an aponeurosis. When your arch lowers (usually because of a foot malfunction called pronation) the distance between the heel attachment and the front attachment gets longer and the fascia gets put on stretch. A fascia is a type of tissue that has a lot of reticular fibres and not a lot of elastin fibres. This means it is a ‘steel cable’ not a stretchy one. Over time, if there is too much stretching tension, the bone will try to ‘help’ by growing forwards to decrease the span of the arch. This is a heel spur or calcaneal spur. When seen on an x-ray, a spur looks very pointy and most people think that it is standing on this sharp thing that hurts. In fact, the spur pokes forwards not downwards and doesn’t come anywhere near touching the ground. Heel spur pain seems to the sufferer like it is brought on by pressure up from the ground and, while poking the heel can bring on the pain, the problem is different. The pressure is actually longwise through the arch. It is this elongation pressure that causes the pain and causes the spur to form. This is an important concept. The pulling causes the pain. The pulling causes the spur but the spur does not cause the pain! This is why the pads available in the chemist shop etc that merely cushion the heel, do not work. They provide a slight benefit by lifting the heel off the ground (which we will discuss next) but a heel spur is ultimately an arch problem, not a heel problem.